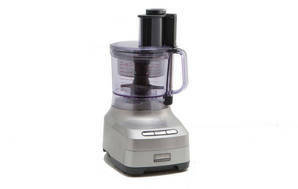 Snapshot: The Sunbeam LC9000 Cafe Series Food Processor has 1 speed and a storage drawer for most attachments. How does it rate? Excellent results in our carrot-slicing, pastry-kneading, and breadcrumb-chopping tests. Very good results in our cheese-grating and mayonnaise-emulsifying tests. Storage drawer for most attachments. Comes with two processing bowls. Large heavy unit that can move on the bench. Can be fiddly to lock bowl and lid into position. "Sunbeam LC 9000 Food Processor"
22 Aug 2015, Graeme S.
It is powerful, has very good capacity and does everything I want it to.